"Where exactly is it?" Miss America demands curiously. He, Queen Viv, Mr NQN and I are all sitting in the car driving slowly down Belmore Road. We're somewhat expecting a big ol' American flag to announce the diner's presence but instead there's just a small collection of restaurants. 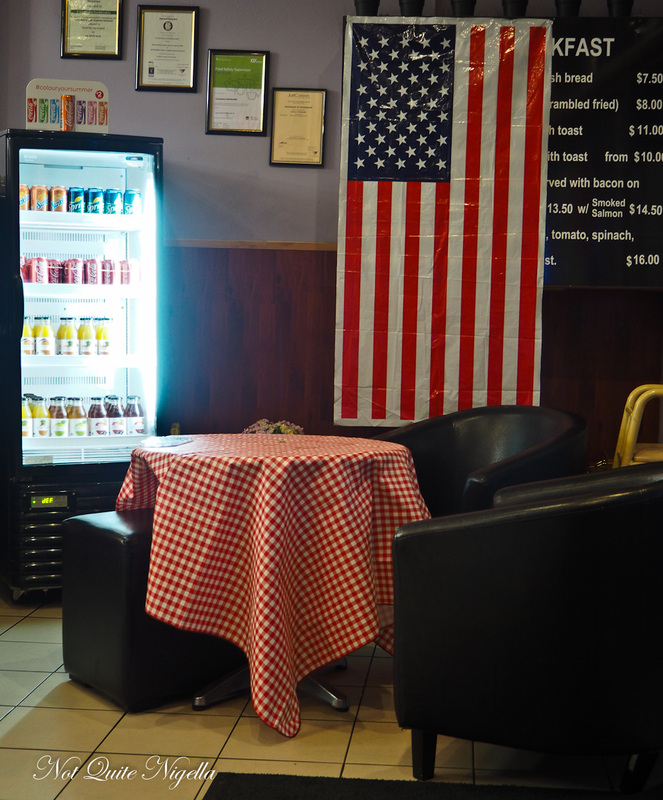 "It's in the Spot Cafe," I tell them explaining that it is a cafe during the day but on Friday nights, it transforms into Miss America's Diner serving hot dogs, burgers, shakes and fries as well as of course what else but apple pie. When Belinda first spotted the diner on Instagram, she sent it to me conjuring up memories of our own road trip down South last year. Naturally we would invite Miss America along as well as Queen Viv and one Friday night we all bundled into the car and made the 50 minute trip out to Riverwood dodging Friday night traffic and laughing raucously while catching up on everyone's lives (including Queen Viv's stoush with Nigerian cat scammers!). 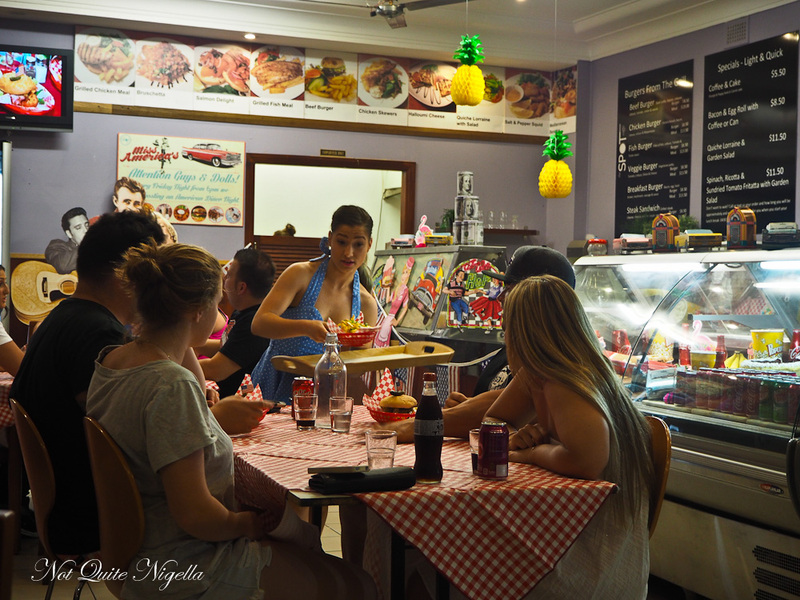 Oh how we do love food adventures! Miss America's Diner is run by two sister Constance the chef and Alexis the waitress. 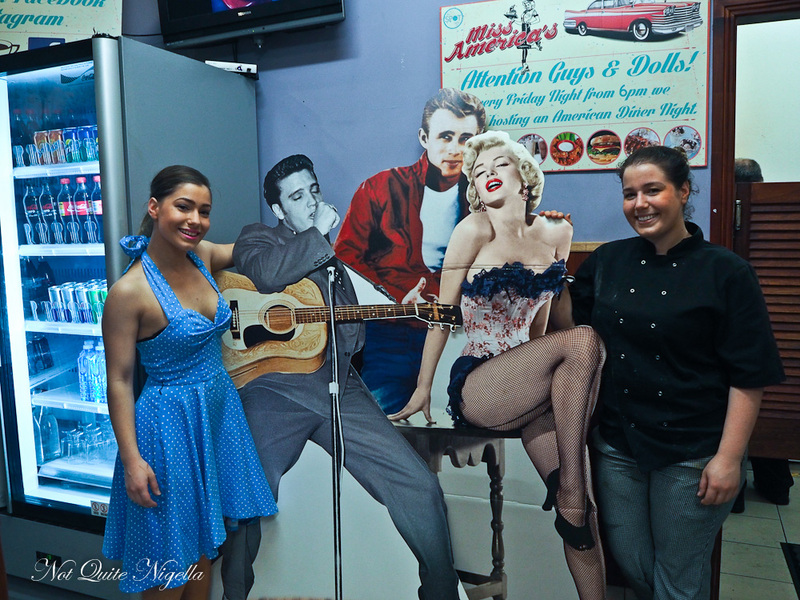 They tell us that it has been their dream to open up an American diner for years. Service is friendly by Alexis. Belinda who meets us there as she works nearby had booked with them through Instagram and she tells me that they had looked up her photos and offer a deck of jumbo playing cards in case her two daughters Mia and Ruby were coming along. 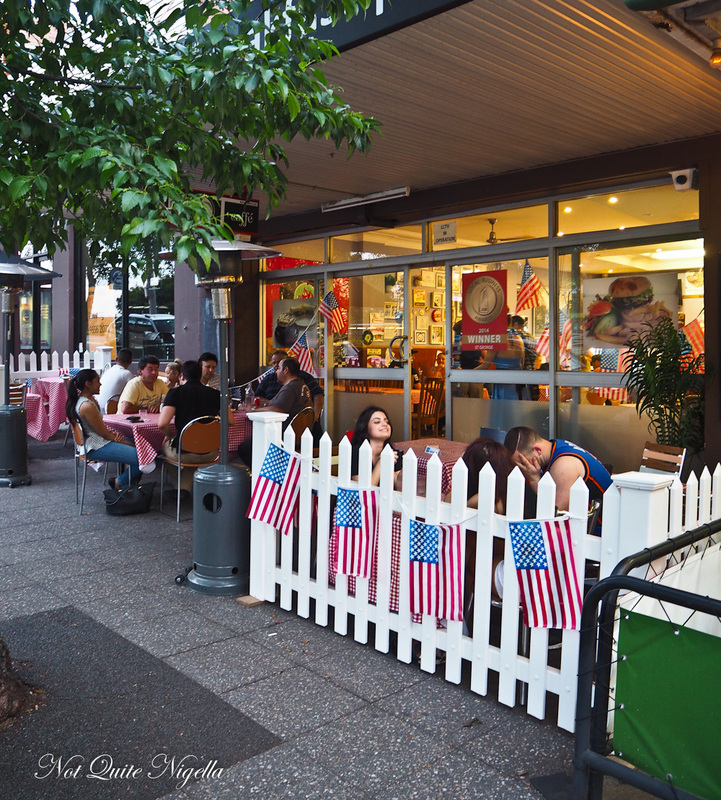 Outside the restaurant are American cars and motorbikes and a white picket fence and it is busy this evening. Inside the decor gets a quick change from the cafe to American diner with removable retro Americana pinned to the walls. Cut outs of Marilyn, Elvis and James Dean adorn the back wall while Rock N Roll records hang up on another. 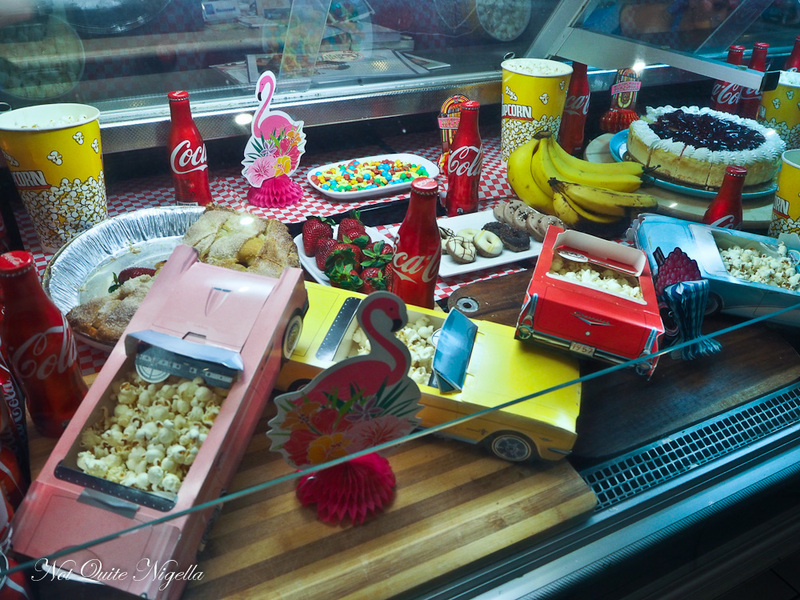 The glass display cabinet features apple pie and cheesecake as well as an assortment of American soft drinks. The music is Elvis and rockabilly. We are handed the two page long menu. There is a list of floats or spiders as well as milkshakes and you can say "fat" in front of your milkshake choice to make it a thickshake. They set down some cutlery in a tin and a packet of wet wipes - we will definitely be needing them. While the food is inexpensive at around $10 for a burger the drinks are a bit on the expensive side, particularly the thick shake. 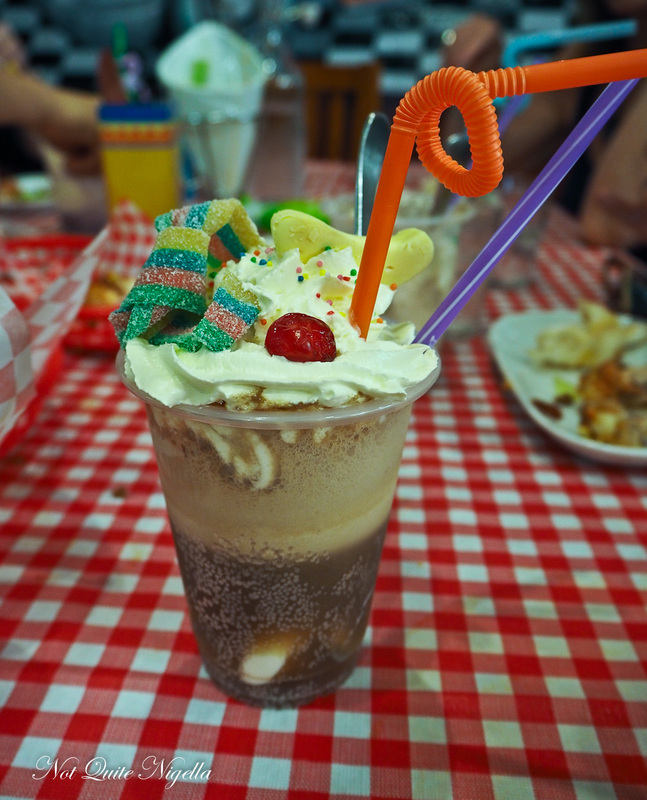 The grape float is probably the favourite along with Miss America's root beer float. The malted brown cow needs a lot more malt to really be called a malted. 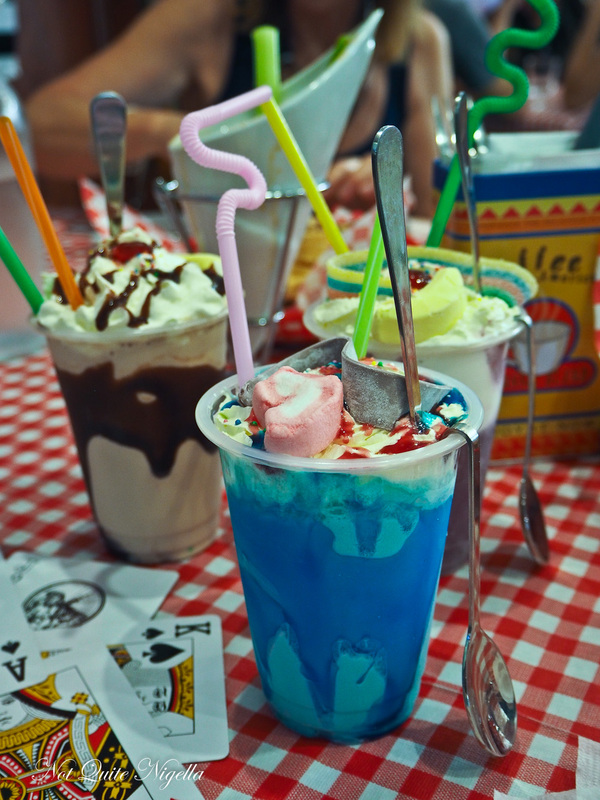 We do however adore the lollies and strips of sour and bubblegum on top for a bit of added fun. The first food to come out are the hot wings or "hot waangs" as they call them (I try not to think of the American slang word wang!). In lots of six they are served deep fried and then dunked in a delicious vinegar wing sauce. 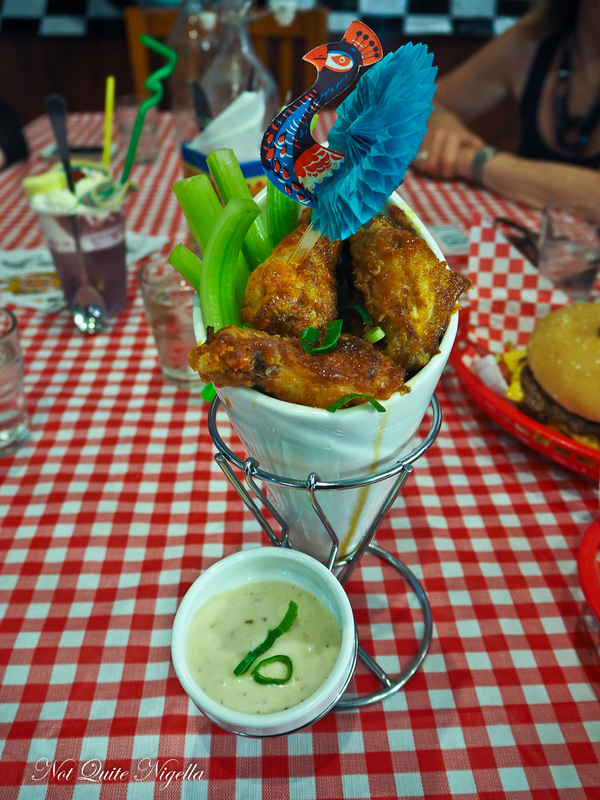 There is also a blue cheese sauce that comes with them and we enjoy dipping the wings in this as well as the celery sticks - another American touch. And I must say that the paper peacock sticking out of it is pretty fabulous. Alexis tells us that this is her creation. 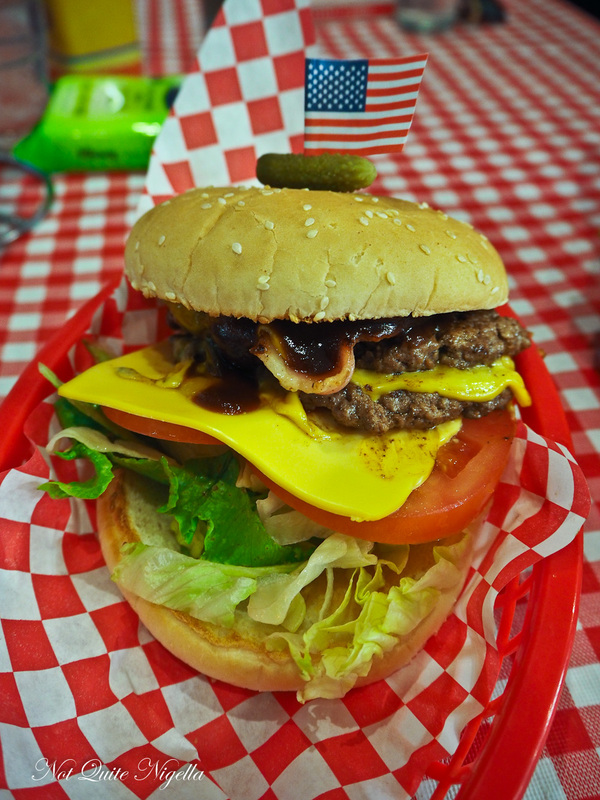 The James Dean burger is a classic style beef burger with double beef patties separated by cheddar, bacon, another slice of cheese, lettuce, tomato, onion, pickles and sauce. 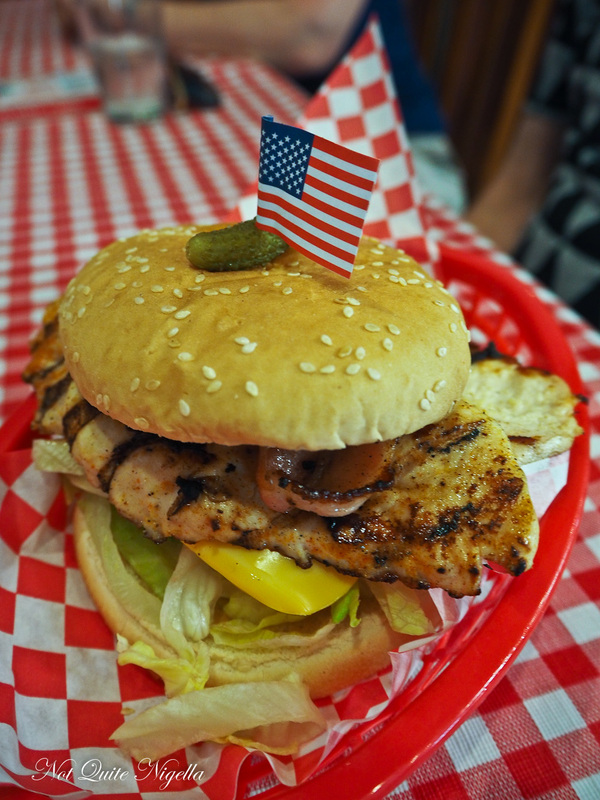 The whole thing is served on a soft, toasted sesame seed bun with an American flag toothpick and cornichon. My favourite burger is the chicken breast burger that is served tender and flavoursome with bacon, cheddar, lettuce and honey mustard. I prefer the chicken breast to the beef patty and it tastes like a wholesome burger. I have to stop myself from eating more but we have a lot of food coming! 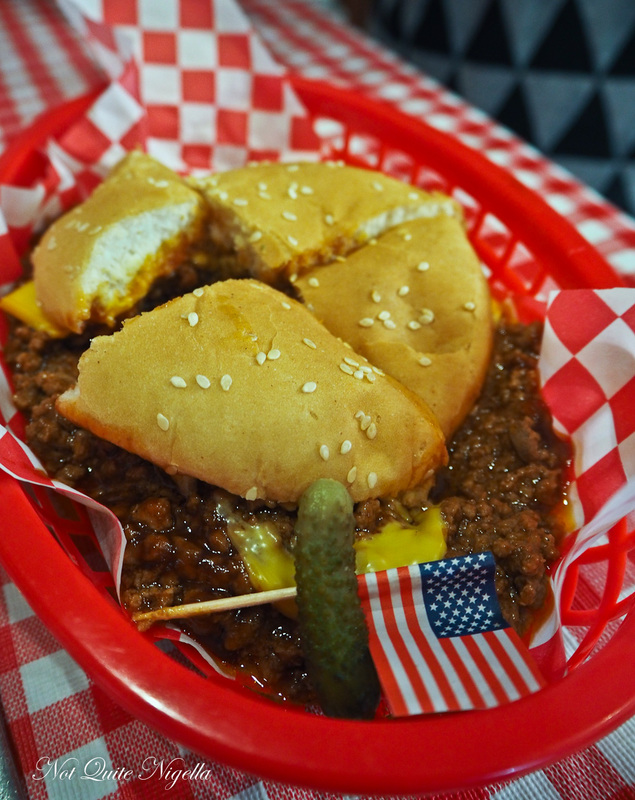 Belinda's favourite burger is the Sloppy Joe that she likes for the sweet, soft mince replacing the burger patty. I like a bit more texture to things but it has a comforting texture to it that offers little resistance to teeth. When presented with the choice of two hot dogs with such fun names the only real solution is to try both! 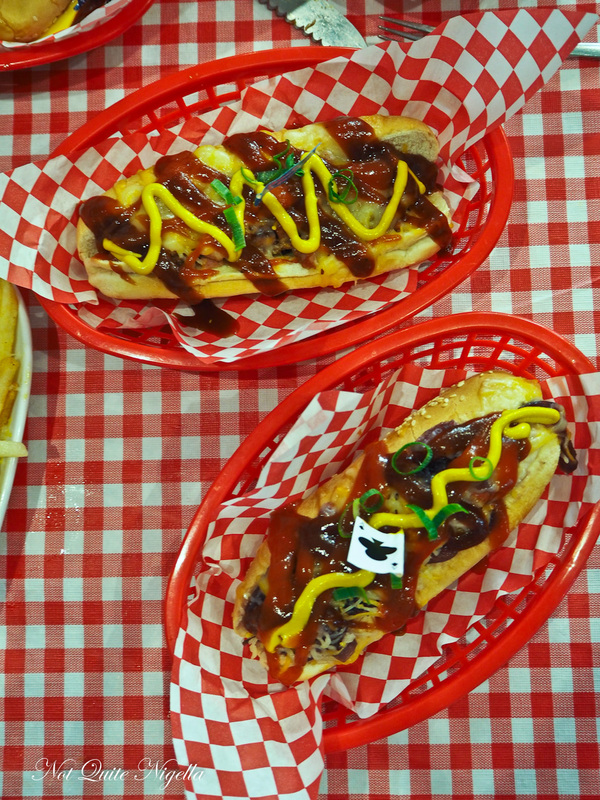 The Fat Elvis is a kransky dog topped with sweet onions and lashings of melted cheese. The hot diggity dawg is a steamed dog with cheese and bacon. They're both good-the sausages juicy and well cooked and the buns soft but I think I prefer the extra smokiness of the kransky although they are both quite similar. We had to order the "Heart Attack" although it was a close call between these and the chilli cheese fries and when Constance places it on our table she laments the unphotogenic appearance of these fries. "If anyone can take a good picture of it I'll pay them for it!" 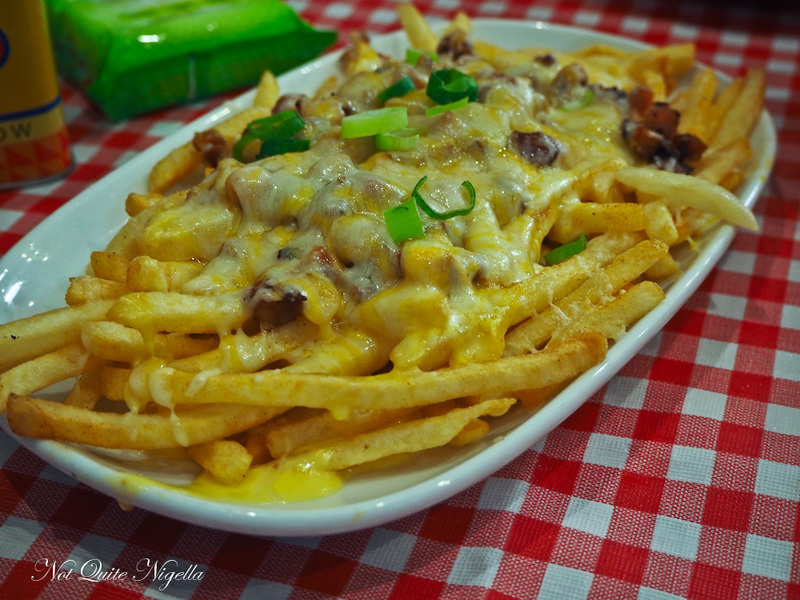 The Heart Attack is skinny fries layered with crispy bacon, melted cheese and shallots. The cheese is that particular kind of cheese that is creamy like Velveeta and I dipped them in the blue cheese sauce for a bit extra flavour. We have a bit of a break. All of the food came at once and as we were all quite hungry it was a bit like a feeding frenzy and we need a bit of a break before dessert. 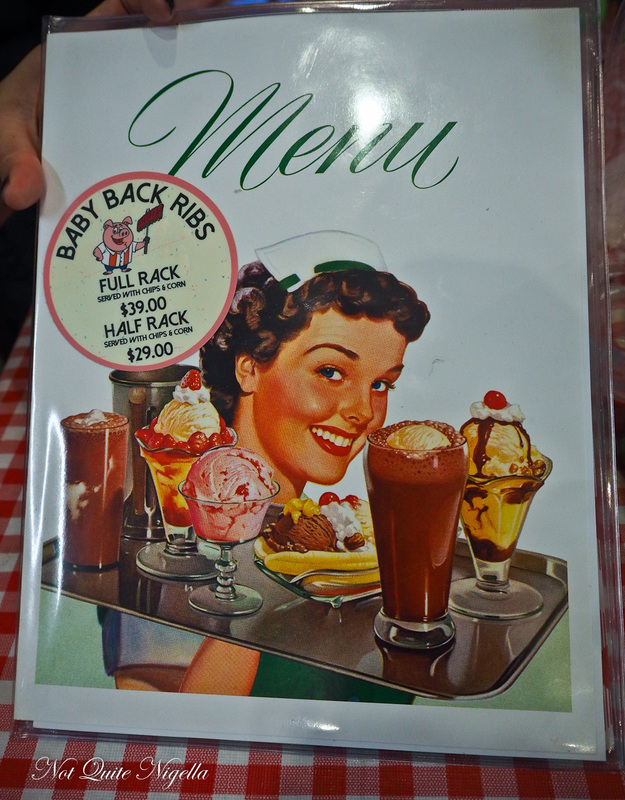 Alas by the time dessert rolls around, they are out of the Key Lime pie but the other options are available. 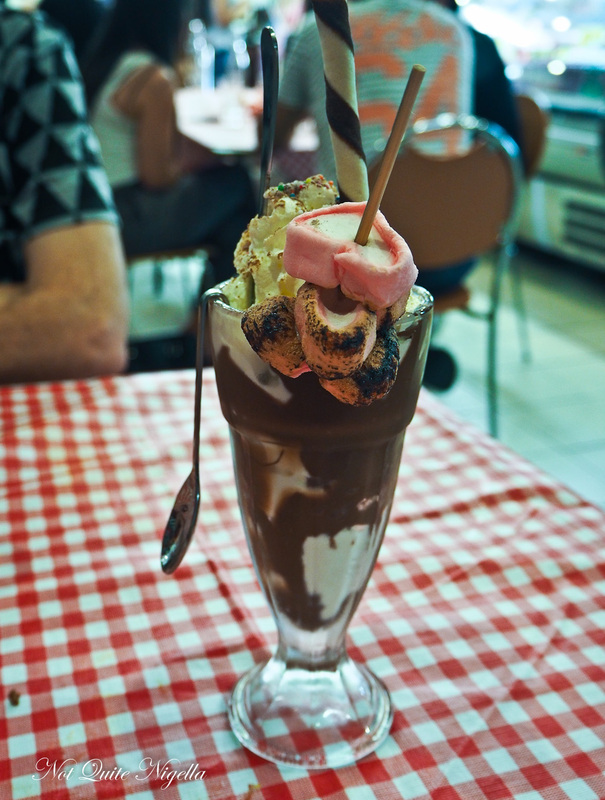 The S'mores sundae is about 80% Nutella on the outside of the glass with some toasted marshmallows in the centre surrounded by soft serve. It's rich (like the 80% Nutella couldn't have told you that) and best savoured in small, satisfying bites. The biggest treat is of course grabbing one of the toasted marshmallows hanging off the side. However my eyes were really on the apple pie. 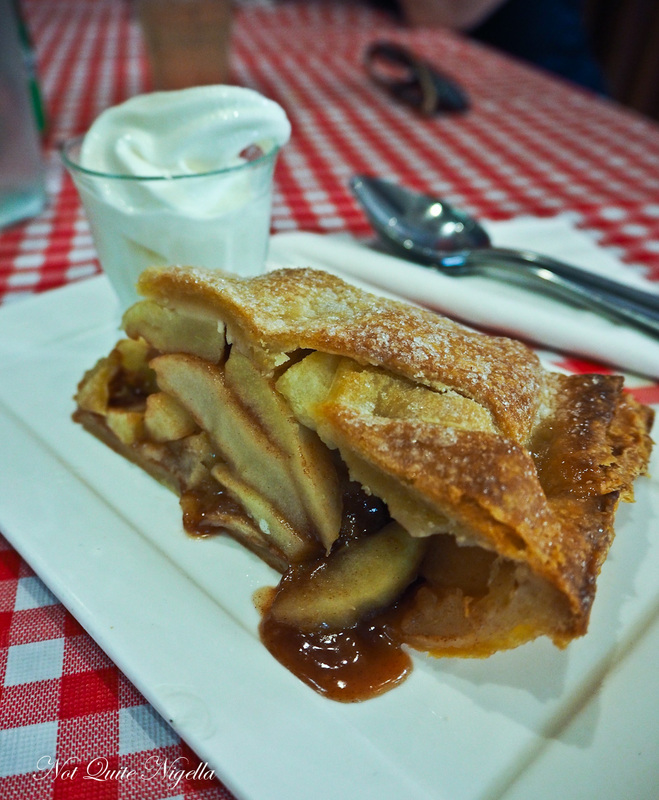 Served warm with a small pot of soft serve there are large chunks of apple and thin, tender and melting pastry on the outside with just the right amount of sweetness and aroma from the cinnamon. Sweet as suga' as Miss America would say. So tell me Dear Reader, these are a or b questions. Burgers or hot dogs? Chicken or beef burger? And milkshake or thickshake? featureSocial Experiment: Who goes to Hooter's on Valentine's Day? restaurantSouthern Barbecue Ya'll at Hughes Barbecue, Waterloo!